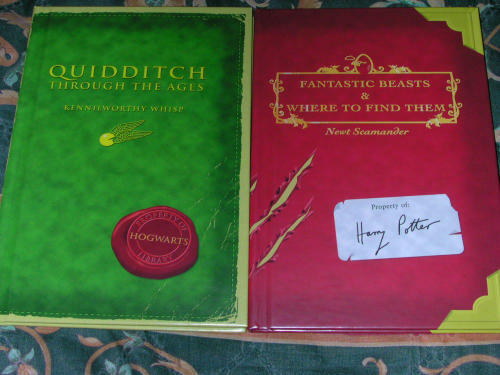 The set of two books, "Fantastic Beasts and where to find them" by fictional Newt Scamanderand "Quidditch through the ages" by fictional Kennylworthy Whisp, were written by J.K.Rowling and published in 2002, in aid of Comic Relief, a charity. These books are mentioned throughout the lives of Harry in the main series. "Fantastic Beasts and where to find them" has Harry, Ron and Hermione repeatedly commenting and playing games in the book, like any everyday student. The book is a property of Harry Potter and is shared by Ronald Weasley as he cannot by a new one (he spent his money on Dungbombs, which irrated Hermione above all others). This book is needed by all first year students needed. It's basically a small encyclopedia on those beasts, with M.O.M. (Ministry of Magic) classifications going from X (boring) to XXXXX (known wizard killer/impossible to train or domesticate), or, as a scribble next to it reads, "or anything Hagrid likes." And what is a beast defined as? The scribble in there reads "big hairy thing with too many legs." The second is Quidditch Through The Ages by Kennilworthy Whisp, with a seal reading "Property of Hogwarts Library" which reads like a history book and goes first from the development of the broomstick as a form of transport to its use in sports. This takes the reader to brief descriptions of early broomstick games, and then to a certain game played at Queerditch Marsh in the 11th century. The evolution of the game is detailed, but the most fascinating part is the origins of the Golden Snitch, which itself has a sad but ultimately humane ending. 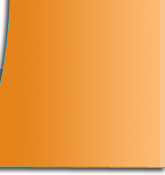 However, I consider it a good move to have the blooders made of stone to Bludgers made out of iron. Both would still be very painful if one was smacked in the gourd by one. Other bits include major Quidditch teams, slang terms, broomstick models, and Quidditch moves (such as the Wronski feint, which Harry does in the first movie in order to reach the Snitch). 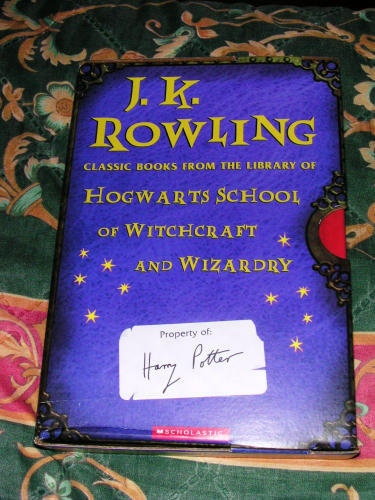 However, the book has duplicated wear and tear, plus a list of pupils who've checked this book out, include Oliver Wood, Angelina Johnson, Millicent Bulstrode, and the last two names, who are more than well known--a certain Hermione Granger and Harry Potter. Those who are into HP will recognize the names I've listed.